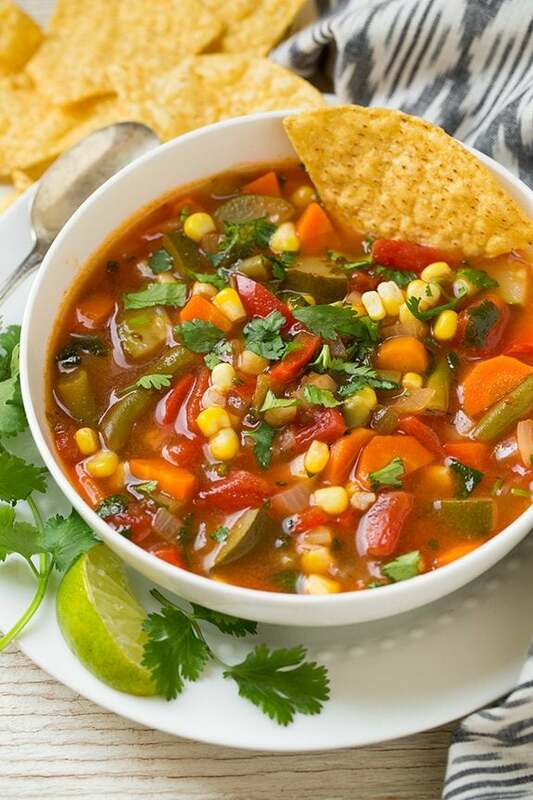 Mexican Vegetable Soup – A deliciously healthy, low fat, low calorie soup that’s packed with lots of vegetables! It has so much delicious Mexican fresh flavor and perfect for serving any day of the year. 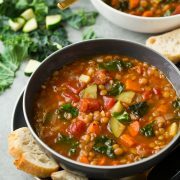 Even though this is a vegetarian soup it is hearty and filling and it’s perfect for a comfy cozy dinner. 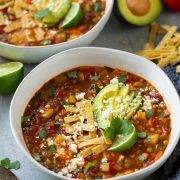 This soup is low in fat and packed with good for your ingredients, so this could definitely be considered a diet friendly soup (just don’t serve it up with the tortilla chips like I did). 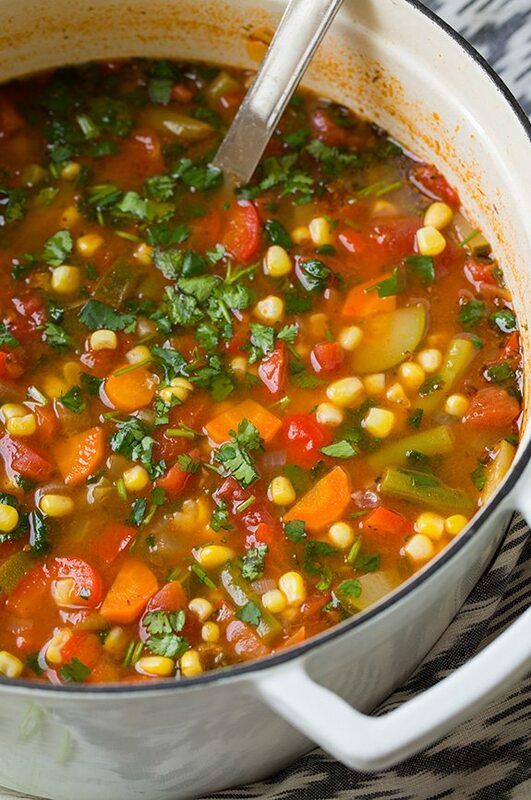 It’s like a traditional vegetable or minestrone soup with a hint of Mexican flavors and if you’re lucky enough to have any left it will make for perfect lunch the next day. 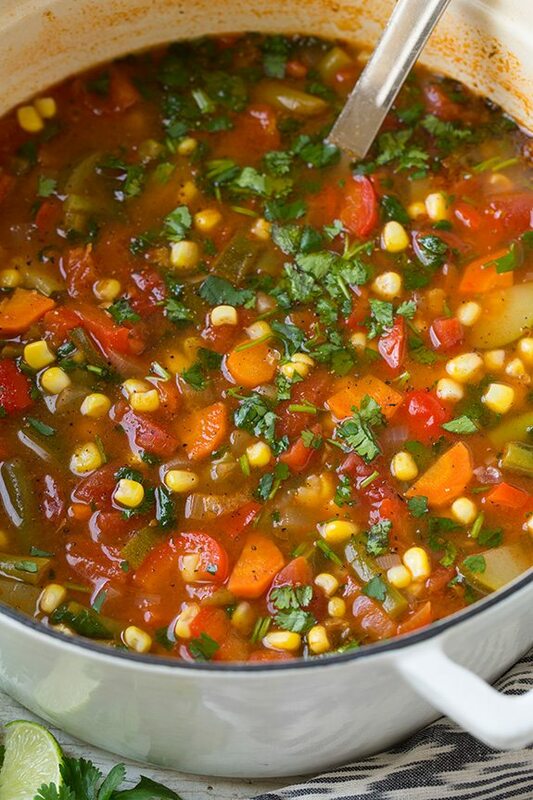 If you are trying to eat healthier this soup is a great place to start. It’s the perfect way to get a ton of bunch of veggies in your diet in one sitting. How Can I Make it Spicy? You can also add a jalapeno pepper or some chipotle peppers if you want to add in some heat (note that it will have a mild heat to it because of the green chilies so if you don’t like any heat just use plan canned tomatoes). You can swap out the veggies here with others you might have on hand peas, asparagus, cauliflower etc. And if you are looking to just cut the list down you can omit green beans because you’ve already got the zucchini so they aren’t really a must. What Should I Make with the Remaining 1/2 Can Tomatoes? You can add the remaining canned tomatoes to taco salad, chili, drain and add to eggs, or freeze the remaining half to make this soup again later. 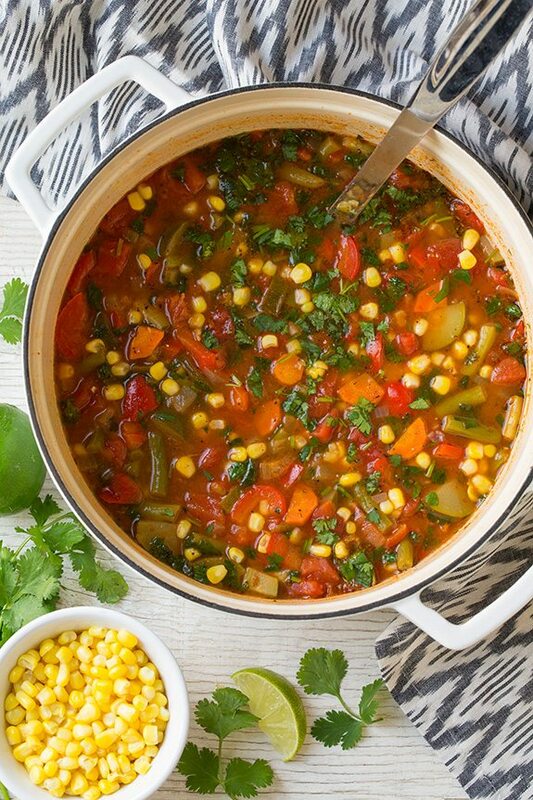 A deliciously healthy, low fat, low calorie, veggie packed soup! Filled with Mexican fresh flavors and perfect for serving any day of the year. Stir in vegetable broth, tomatoes, zucchini, green beans, bell pepper, oregano, cumin and season with salt and pepper to taste. Bring to a boil then reduce heat to medium-low, cover and simmer until veggies are soft, stirring occasionally, about 20 minutes. Stir in corn, lime juice and cilantro and cook until corn is heated through. Serve warm. Shannon McIvor: This recipe was an incredible find. It is a case of “the whole is better than the parts”, where the flavours combined to make such an incredible taste. I cut a half an avocado as a garnish on top and I have to say that this is one of the best soups i’ve Ever tasted! And I get to make it anytime I want!